As you probably know, reviews, recommendations and testimonials are a really important part of your marketing. Customer feedback surveys are a good way to collect these. They are also useful to let you know how your service is perceived and what, if anything, you need to change. The big brands know this too. Like me, you probably get followup emails from them asking what you think. Question. What’s in it for me? 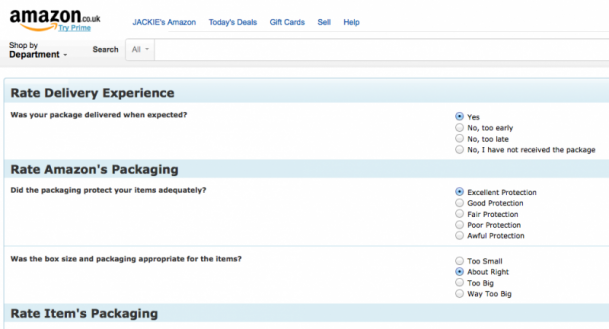 Why should I help improve Amazon’s packaging? It’s bad enough that I get asked to rate every product never mind what it’s packed in too! 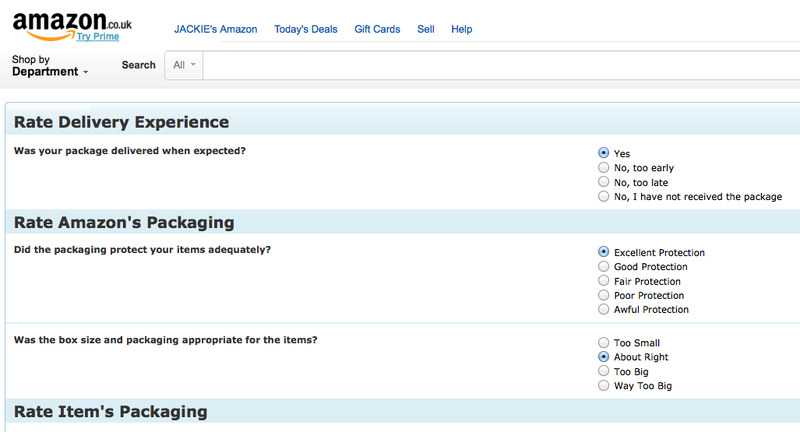 I answered the three main multiple choice questions – but underneath was a separate question for every item I’d ordered. I ignored those because they were presents. I don’t plan to open them just to tell Amazon about how well (or badly) they’re packaged. Look how lovely and simple that is? All I had to do was click one ‘traffic light’ button. It took less than a second. P.S. I recently wrote a followup email for one of my retail clients in order to collect more feedback. Ask me if you’d like my help with yours.